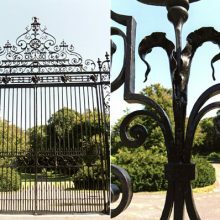 The Carshalton Gates are an extraordinary example of early 18th century English ironwork. 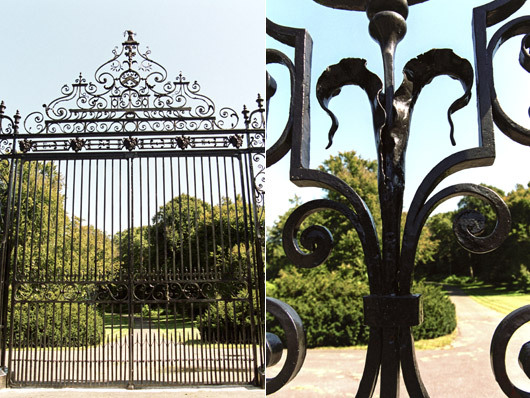 Dating to 1711, these massive wrought iron gates exemplify the blacksmith’s art as it existed prior to the invention of the Bessemer process and the inexpensive production of steel. Each element is hot forged into shape and held together with mortise and tenon joints, tightened with wedges and pins. 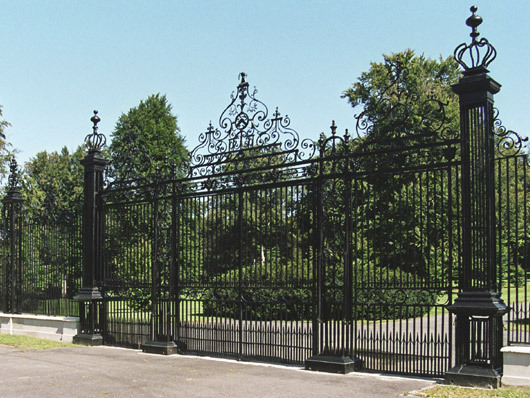 The gates were removed from an English estate and installed in 1926 at The Planting Fields Estate, NY, one of the great houses on Long Island’s Gold Coast. 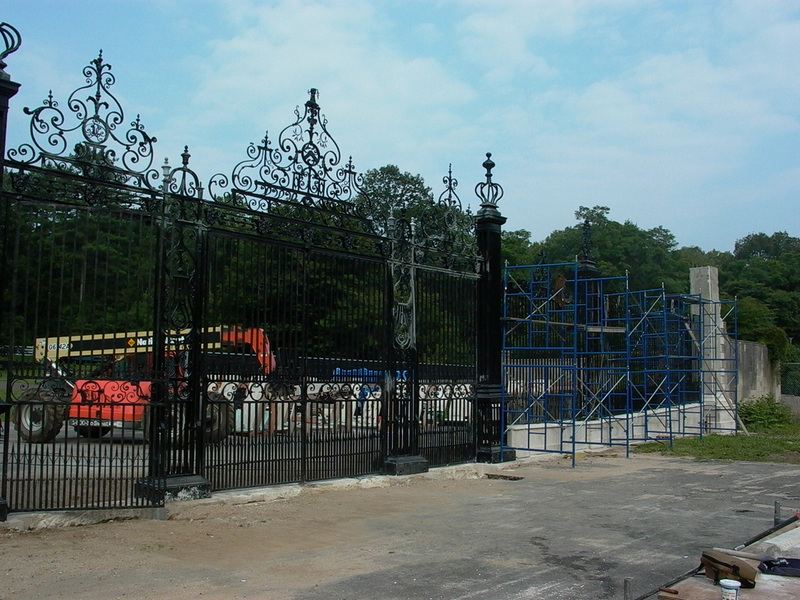 We completed the restoration of the Carshalton Gates between 2003 and 2004. 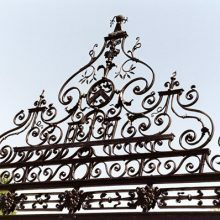 The gates were documented before removal from site. 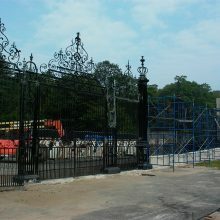 Careful measurements were taken to assure that the gates could be reinstalled after restoration. A paint analysis was done prior to treatment to determine the original paint color and scheme. 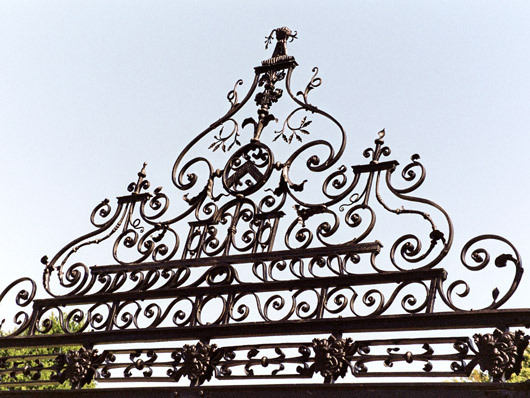 Each element was stripped of existing coatings and assessed for damages and necessary repairs. Most losses were associated with entrapped water which led to rust formation. Work was divided into unit replacements, in-kind repairs and synthetic fills. Skilled craftsmen repaired losses in keeping with the original design and assembly details while removing water catch points. 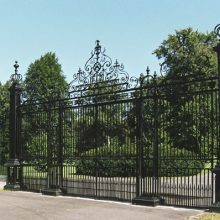 Upon completion of the restoration, the gates were again cleaned and metallized before being coated with a high performance paint system. They were transported to the site and installed atop their restored stonework.